"My very first reading with cards was done by Sonya with the Transformation Oracle Deck and it was so accurate and helped confirm to me my sense of purpose in continuing on my journey. I was fascinated by the positive energy of the cards and the way the elements were used to help me understand some of my own feelings. Since the class I've done a some readings for others and it has been a wonderful and enlightening experience. 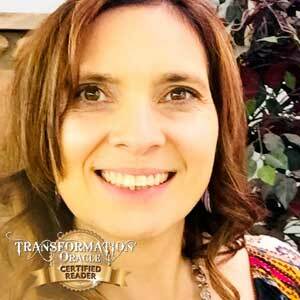 The Transformation Oracle Cards use of elements seems to help with the balance and the energy of individuals ever changing lives and serves as a tool of guidance for those seeking it." Please call 719-250-9585 or click here to email Jeanette for an appointment. Explore Jeanette’s reading style through this chakra spread. Get inspired by Jeanette’s Transformation Story!